The purpose of the hearing is to obtain testimony of the property owner and/or business operator, plus affected and/or interested persons regarding a site that has generated numerous complaints and required consistent police enforcement. As the present use may jeopardize and adversely affect the public health, peace, and safety of persons residing and working on the premises and in the surrounding area, and has documented reports of repeated nuisance activities, the City has responded with a public hearing for possible imposition of conditions to abate the nuisance or to revoke said use. 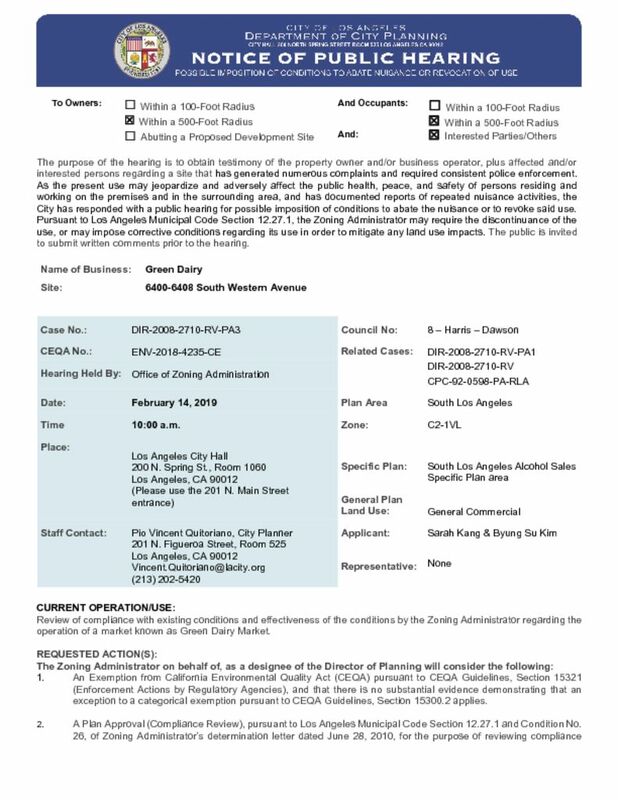 Pursuant to Los Angeles Municipal Code Section 12.27.1, the Zoning Administrator may require the discontinuance of the use, or may impose corrective conditions regarding its use in order to mitigate any land use impacts. The public is invited to submit written comments prior to the hearing.